If you are seeking top-notch pick and stick services, look no further than 3PL Center. Our third-party logistics expertise is second to none, and we have an array of Grade A warehouses across North America that you can use. Whether your products are shipped by a single piece or a full case, our team is able to pick it and stick shipping labels on them; and offer special labeling for companies like Amazon, TJ Maxx, Walmart. What’s more, our pick and stick option is the most affordable shipping option you can find on the market. 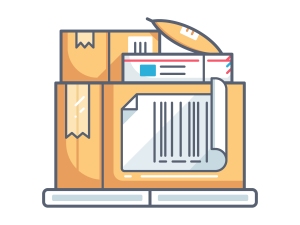 Our pick and stick solutions are designed to ship out your products fast, and keep your inventory clean and manageable at the same time. What is Pick and Stick? Pick and stick services include the picking, checking, processing the order and label and sticking it on the box. The reason why this is the cheapest fulfillment solution is because it’s the easiest way for us to pick and ship for you. No taking pieces out of a box, no repackaging needed! If you want to focus the bulk of your attention on core business functions such as marketing and selling, you will benefit from our pick and stick services. Why Should You Choose 3PL Center for Pick and Stick? 3PL Center is a trusted third party logistics company with a combined experience of more than 45 years. Since our inception, we have been managing premium-level warehousing facilities and using the most advanced warehouse equipment. Whether you are a large-scale global manufacturer or small- to mid-sized wholesaler, or e-commerce site we provide stellar pick and stick services with unmatched dedication and passion. You can rest assured that we adhere to a foolproof 99.99% accuracy. Our warehouse team utilizes our warehouse management system, to find the proper product in the warehouse, scan and check the product and check again before placing the shipping label. This ensures a cost-effective process during shipping, which keeps you and your customers happy! We have the capacity to handle multiple numbers of industry verticals and tens of thousands of SKU’s, and that’s why we can make shipping to a high number of retailers easy for you. At 3PL Center, we also manage automated facilities that are equipped with compliance labeling systems. Before your carton is scanned, it is staged on a zone control conveyor. We can obtain the compliance label information in no time. As your carton is cornered, proper label placement is guaranteed. When you work with us for your pick and stick needs, we offer the highest level of assurance: we always scan the barcode of your cartons to ensure readability and proper label placement (after the labels are applied); we take photos; and we store this information in our database as backup. Ready to Get Started with Pick and Stick? 3PL Center offers highly competitive and straightforward pricing for our services. If you want to learn more about our pick and stick procedures, don’t hesitate to contact us today.